Ardashir was the first king of the Sassanian dynasty. He defeated the older Arsacid dynasty in battle in 224 AD and took power as the ruler of the Parthian Empire (modern Iraq and Iran). Like the Arsacids, Ardashir followed the Zoroastrian faith. Ardashir tried to push the Romans out of Iraq and Armenia in 230 AD, but the Romans under their empress Julia Maesa pushed Ardashir back. 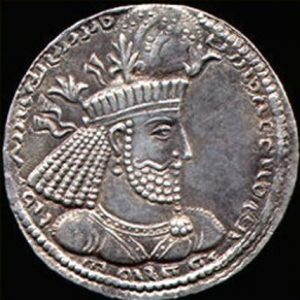 Ardashir spent most of the rest of his reign reorganizing the Parthian Empire and getting more of the power into the hands of his central government. As Ardashir got older, he shared power with his son Shapur. Then Shapur ruled alone after his father died in 242 AD. Shapur attacked the Romans again, and this time he won – he pushed the Romans westward out of Iraq, and he even captured and killed the Roman emperor, Valerian. Shapur was a Zoroastrian like his father, but he followed Cyrus the Great in being open to people of all religions, so many Iraqis and Iranians became Christians or Buddhists. Mani also started the religion of Manichaeism at this time. And many Jewish people lived in the Parthian Empire under Shapur. Shapur also kept up Silk Road trade, and built or repaired major dams and canals to improve irrigation in Iran. Shapur died in 270 AD, and his youngest son, Hormizd, became the new king. Hormizd attacked eastward instead of westward, pushing the Sogdians east. But he died after only one year, and his older brother Bahram took power. (This tendency to pass power to brothers is the same as the earlier Arsacid Parthian rulers.) Unlike his tolerant father, Bahram persecuted Mani and the Manichaeans. 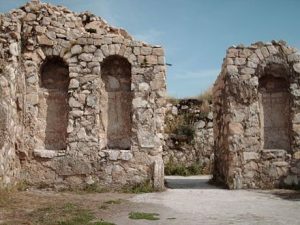 Mani died in prison, and many of his followers fled west into the Roman Empire. Bahram also turned to the west, where he sent an army to help Zenobia’s revolt against Rome. Bahram died in 274 AD, starting a period of civil wars between Bahram’s son Bahram II and various cousins. As a result the Romans succeeded in getting back a lot of Iraq, and Armenia became more independent and more powerful. Bahram’s son Bahram III failed to get any support, so Shapur’s last living son Narses took power instead in 293 AD. Unlike Bahram, Narses encouraged religious freedom and let many Manichaeans who had fled under Bahram move back to the Sassanian Empire (and even some Roman Manichaeans who were being persecuted by Diocletian). 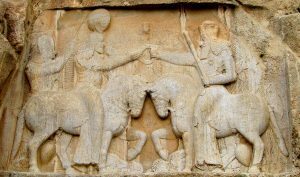 Narses led the Sassanian army to try to get back the land they had lost to Armenia. He won at first, but then lost very badly to the Roman Emperor Galerius, and had to give a lot of Iraq and Armenia again. Narses (who must have been pretty old) died in 302, and his son Hormizd II took over the Sassanian Empire. Cite this page: Carr, K.E. Sassanian rulers from Ardashir to Narses – West Asian history. Quatr.us Study Guides, March 19, 2018. Web. April 21, 2019.